Price and quality for the high-volume shooter. Item not currently available for sale. Pistol Shooting Dynamics® Ammo: price and quality for the high-volume shooter, utilizing premium Hornady® bullets. For nearly 150 years, Fiocchi® has been the gold standard for affordable excellence. 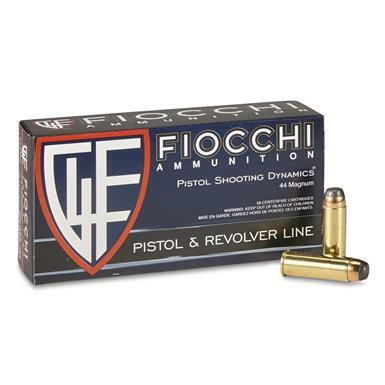 Fiocchi Shooting Dynamics, .44 Magnum, JSP, 240 Grain, 50 Rounds is rated 4.8 out of 5 by 30. Rated 5 out of 5 by Doug B from One Shot One Kill This is the life saver. I was only able to shoot 18 rounds in my Taurus 444 Ultrlite before wimping out. Accuracy was top notch, recoil-That's another story! This monster round will make Dirty Harry quiver. This is my Bear, Hog & Werewolf Round. When it's all on the line-this is the round to use. Great price too. Rated 5 out of 5 by Glock45G21 from Great Deal I use this ammo in the range no complaints at all! !I recommend!! Rated 5 out of 5 by Carl from Great price! perfect for practicing and target shooting. Rated 5 out of 5 by Buzzer Boy from Good ammo. Happy with this ammo would buy again. Rated 5 out of 5 by cvshoot from Mild shoot, good accuracy Put a box through my revolver. Accuracy good at 7, 15, 25 yards. Punched through an 8 inch ash tree at 7 yards, little deformation at exit, but didn't expect much from 240gr JSP. Shot 8 lb. pork roast at 15 yards, bone crushing pass through. Would use for hunting deer/bear/hog and range, not home defense.